Come out to support The Literacy Cooperative’s efforts to obtain funding to pilot a Tutor Training Collaborative in Cuyahoga County! On February 23, 2012, at Shaker Launch House, Cleveland Colectivo is hosting a Fast Pitch Presentation Night. Presentations start at 6:30pm, expected to last until 8:30pm. Click here for details. Admission is $5 and you get to vote on the one idea to receive the cash collected that night. Several projects will be invited to submit a full application for funding. In addition to the potential funding, it is a great opportunity to increase awareness and support for the Tutor Training Collaborative. Please save the date, share this in your networks, and bring some colleagues and friends! You can just show up, but I’d love if you would email me (Meagen at farrellink@yahoo.com) so I know how many friendly faces to expect. About our project: Our vision for the tutor training collaborative is a centralized portal that provides quality tutor recruitment, training, certification, and recognition for adult literacy providers in Cuyahoga County& eventually for greater Northeast Ohio. 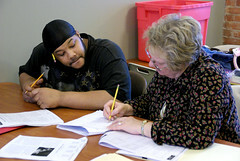 The purpose of the program will be to increase adult learner outcomes through better prepared and trained tutors. The Literacy Cooperative has been coordinating a planning workgroup that is currently pursuing grants to pilot the project.